Welcome to my small farm in Three Rivers, Michigan. I have a slice of heaven on 13 acres. I am surrounded by small acreage farmers so it's a tight knit family neighborhood. I raise Cormo sheep on my small plot. They are wonderful sheep to be around, as they are quite, calm, and produce "lots" of wonderful fiber that has "no itch". Cormo wool is recommended to use for baby garments. 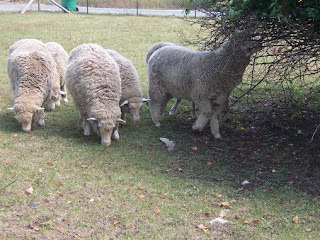 The Cormo are a medium size sheep that makes them easier to handle, and due to their size, they also eat less then many of the fine wool breeds. On the farm we also have the usual dogs and cats. 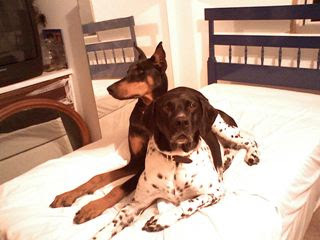 Luke is a rescue that I got from Karen White of Doberman & Rottweiler Rescue in Terre Haute, IN when he was 12 weeks old. If you are ever looking Karen can be found in Pet Finders. Moses is my German Shorthair Pointer. He is a Black and White male that was pick pup from Joy Clay's litter. He used to be my field trial dog, but he is working out at being a wonderful farm dog. 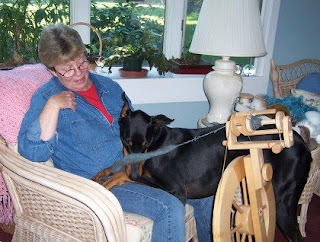 Here is Luke "helping" my sister, Sharon do some spinning. Sharon just started spinning within the last 2 months and is already making wonderful yarn. I hate when "newbies" skip the "rope" stage :>).